As a food enthusiast a walk down West 25th Street in Ohio City can be overwhelming. I mean not that the West Side Market is not enough for a meal or ten but there are so many good choices for beer, sandwiches, beer and gastropub grub, higher end fare and more, and more are more. It is easy for your brain to freeze from sensory overload or on some days – long lines. If quick and easy suits you better, then Bogtrotters Doorstep maybe the recipe for your respite from deciding. The place is less than a hole in the wall, it is a nook or cranny, just a service counter sandwiched in the former side entrance to The Old Angle bar next door. Business is carry out with the exception of two stools and a shelf for eating in. 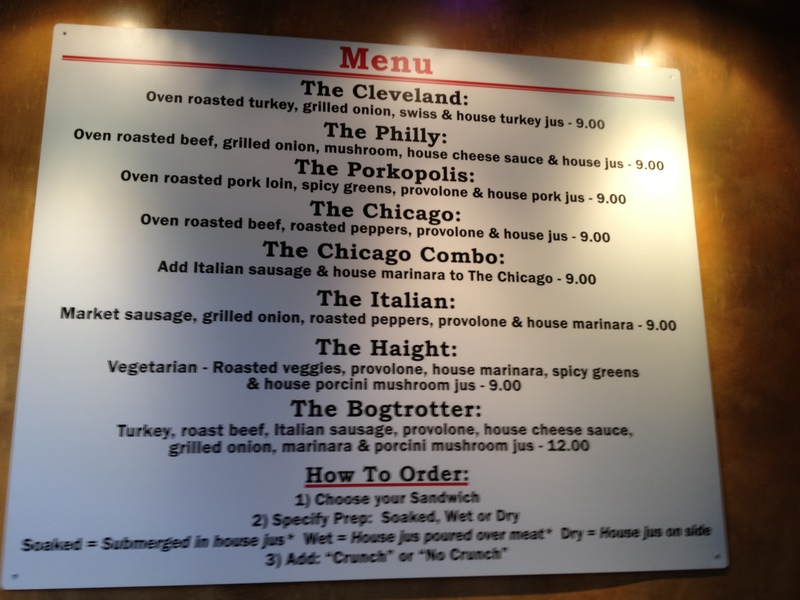 The menu board is small but impressive in the depth of what I would call craft sandwiches. The owner Nate Williams honed his craft for over a decade at the Flying Fig and seems to have put a lot of thought into what might look like a simple sandwich shop. While these sandwiches are perfect for the next door bar crowd they serve as well as late night eaters on the sidewalks (as late as 3 am on the weekends) there is more to these creations that a stack of random ingredients. You can have a good sandwich with great meats but your can’t have a great sandwich without very good bread. The Bogtrotters bread selections are fresh and meld perfectly with the meat and toppings they house. The bread base also stands up well to the (highly suggested) option to get your sandwich dipped, infused or just soaking wet in Au Jus. The meats are long roasted and freshly sliced. All of the ingredients are of the highest quality. These are not generic sandwiches to eat alcohol, these are hand crafted works of culinary art that are a meal by themselves. Ending your sandwich selection process you have the option to order with or with out crunch. 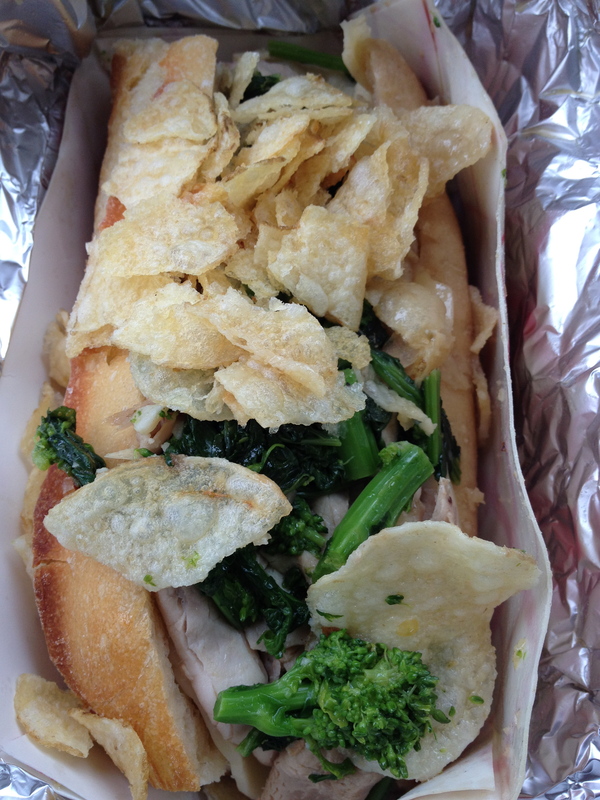 The crunch is kettle style chips piled high on the sandwiche to add more crunch to soak up the juices. I say, go with the crunch. I say order two sandwiches.